This is the first styled wedding shoot EVER to be featured on Engaged and Ready, so I’ve got to admit, I’m pretty excited (Whoop! That’s me being excited). Styled wedding shoots, if you didn’t know, are where a team of wedding professionals come together to create a specific stylised vision or theme for a wedding, which they showcase in wedding publications and help inspire those getting married by giving them ideas for what they want for their own wedding day. So bearing in mind that Engaged and Ready is all (mostly) about matters of the heart over the visual and the aesthetics, although hey, I love the pretty stuff too, you can see why I wouldn’t feature as many styled shoots as other wedding blogs. But when I saw these stunning photos for this shoot and the thought process gone into it, I instantly thought about how this shoot could teach some important heart-led matters of the day, as well as giving you all some jaw-dropping imagery to feast on. So here are five things that you can learn from this styled shoot for your own wedding day. 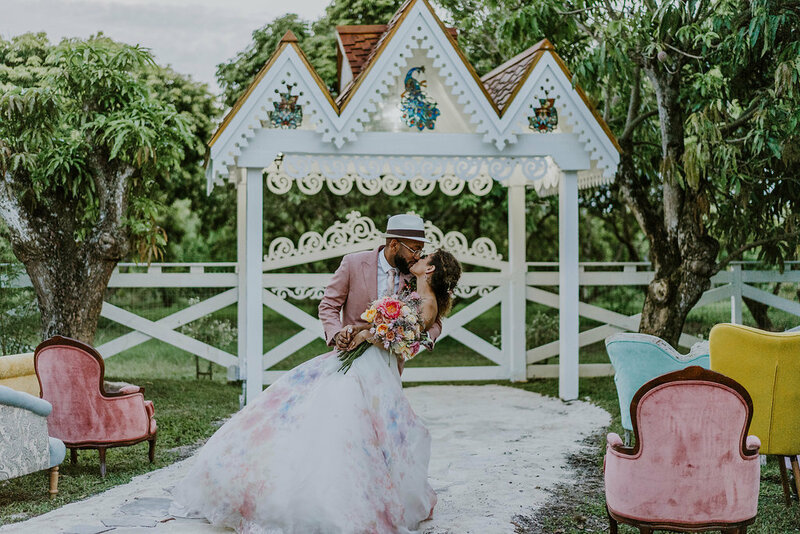 A salmon coloured suit, a floral splashed dress, there really are no rules when it comes to your wedding attire. And the good thing is, it’s not even about not wearing white anymore, but about not even wearing a dress. It’s about wearing whatever the hell you like, trousers, skirts, shorts, suits, kilts, sarongs, kaftans, non-bridal dresses, whatever you like! Don’t get me wrong, I understand the sense of occasion, I understand the history and tradition behind white bridal dresses and formal suits, but I also really like the idea that people don’t feel the need to abide by that anymore. The fact now that we are focusing so much more on putting heart into our wedding day, means that as long as the heart and the soul is there, then who gives a flying fudge about what the couple are wearing. I would happily lead a ceremony for a couple in a tracksuit if that’s how they wanted to be dressed on their wedding day. As long as the love is there, that is all that matters. If there is one thing that couples seriously underestimate, it’s how much time they have together on their wedding day. Yup, seriously. I know you’re celebrating your marriage and all, the two of you committing to each other, but seriously, you won’t believe how little of the day you get to actually be together. Even on the most chilled wedding day, there is still something to do, someone to see and speak to, something that needs your attention. Of course spending time with your guests is also important, they’re there to support you, see you and socialize with you, so time with them is a must, but sometimes your time with each other is at the expense of your time spent with your guests. Now I’m not suggesting that you go AWOL on your own wedding day and bunk off to make out for an hour, but do properly plan on having a little bit of alone time. Time to let everything sink in and to take on the momentousness of the occasion. Time to really appreciate the beauty of the moment. Some couples wait until the end of the evening to have this time, but trust me, if you are anything like me on my wedding day, all you’ll be capable of doing at the end of the night is drunkardly face planting the bed. Here are some ways that you can try and get a bit of quality time together on your wedding day. -A first look before the wedding ceremony is a really special way to have some time together before the show begins. -Going to have some photos taken whilst your guests are mingling and having drinks and canapés, can buy you a bit of alone time. -Setting a sweetheart table (a table for two) instead of the traditional top table is a lovely way to soak up the atmosphere and enjoy each other’s company. -Have a checking-in hour. Make a plan to check in with each other on the hour or whatever time frame suits you best. Even if it’s just for a hello and a quick kiss. However you plan on making sure that you have some alone time on your wedding day, do make sure to factor it in. It’s something you’ll be really pleased that you made time to do. Sometimes, I get the impression that couples feel they need extra special permission to make their ceremony area look off the scale, or even inline with how the rest of their wedding day decor looks. Some couples don’t, and they get it and go straight to town on making their ceremony look and feel like a space where love is going to flow and happiness is going to be in abundance. Maybe there is still some hangover left behind from the traditional church days where church decor was very low-key and barely there. Well, good news, that definitely isn’t the case for your ceremony area, unless you’re going for low-key minimalism. Bright mismatched chairs, aisle ways covered in rugs, huge floral archways, circular displays, macrame backdrops, dream-catchers, hanging glass bottles, candles, whatever floats your boat, go big with it, or go home. This is where love is the most important guest on the list, so hey, make it feel right at home. Check out my post on ceremony arches and these DIY tips for making your ceremony space special and oh so pretty. Do you see how these photographs are so hot damn gorgeous? Well, that’s because they were taken by a hot damn gorgeous professional photographer. And that’s the key people, if you want beautiful photos, get professionals. Now I know that wedding photography is at the costly end of wedding budgets and so it should be. Do you see what these people do for goodness sake? But there are also photographers of all styles and budgets to suit, so don’t dismiss the idea, if you think you can’t afford it. It is also tempting to ask a friend who is a photographer, but I only recommend doing this if you’re going to pay them as a photographer. It’s a difficult call for a friend-ographer because they are in attendance in two capacities, as your friend and your photographer. And it’s not easy for them. When everyone’s having fun, they have to work. So you need to get the boundaries clear, and decide how important their friendship and your wedding photos are to you. Actually I just dropped this one in to get in my annoyance over bouquet tossing. You can of course do whatever the hell you want with your bouquet, if you have a bouquet at all, but I personally feel when you have a bouquet that’s as beautiful as this, it should be cherished. Cherishing it to you may mean keeping it, having it dried, or gifting it to someone special. Bouquet tosses for me are a no-no, I talk about it in more detailhere, but there will always be some who see the fun side of it and don’t look too deeply into what it signifies and means, as I do! And even if you disagree with me, I still think there are nicer ways to treat your bouquet after your big day. And lastly peeps, please promise me that you will write your vows down on some nice stationery and not have them on your mobile phone or on a scrappy piece of paper. I actually don’t know what is worse! 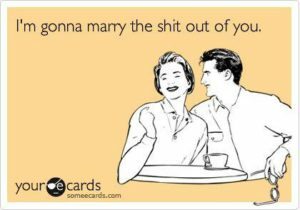 If you’re going to go through all of the effort to write such personal, beautiful vows for your wedding day, then there really isn’t much more energy required to write them on to some nice card, or a vow book. It just finishes off the wonderful sentiments with a nice visual touch. Am I right? Yes, I am. So that’s my six things that you can learn from this shoot. Hopefully, some of those will resonate with you and get you putting things into action that you want to happen on your wedding day.